Sometimes you just don’t want to serve the same typical desserts at your holiday table, yet you still crave those classic fall flavours. 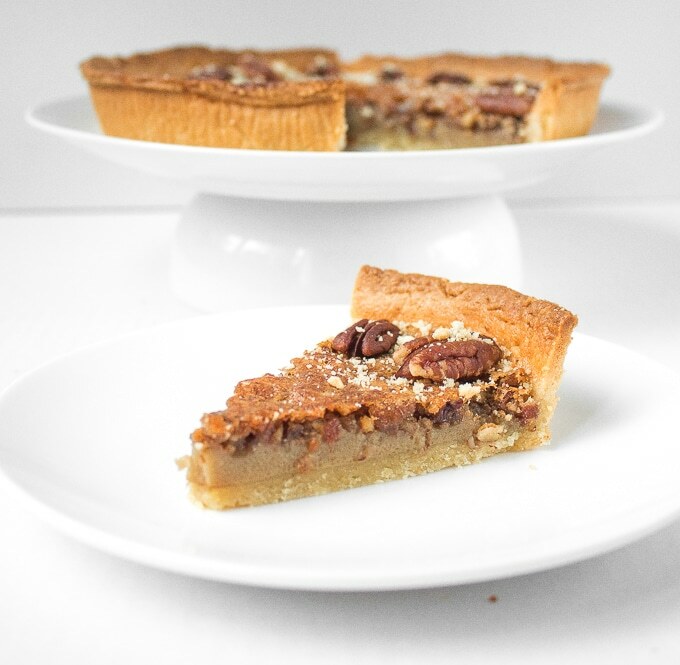 Pecan pie is my favourite holiday dessert and I have changed things up this year by giving traditional pecan pie a twist and using finely (or coarsely) chopped pecans instead of pecan halves to create a smooth crispy topping on what I like to now call, chopped pecan pie! Let’s be honest, Thanksgiving is all about the food, dessert included. So you have to do things right. In the past, I would buy all my holiday desserts from the grocery store. It was quick and easy, but it came at a price. Somehow the flavours of store-bought pies just weren’t as intense and irresistible as homemade. It’s got to be the love that you pour into homemade baking. 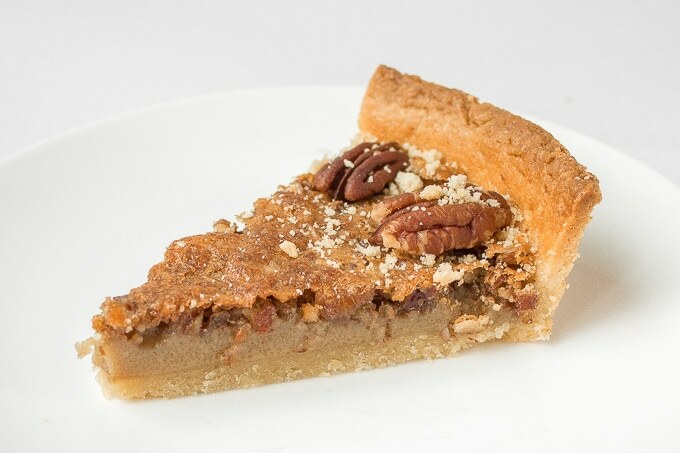 Each bite of this chopped pecan pie is like heaven in your mouth. I mean, how can it not? 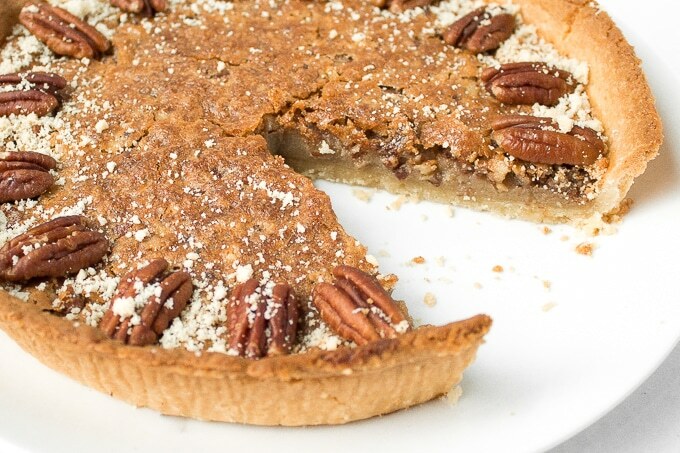 You have got all the amazing flavours of traditional pecan pie in that pie crust, smooth custard filling and pecan topping (with a slightly different texture). 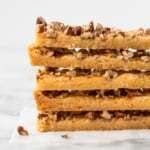 Plus, when using chopped pecans instead of pecan halves you end up with less of a mess on your plate after your fork has broken into the pie. Another amazing thing is that this pie is ridiculously easy to make. You prepare the pie crust, prepare the pie filling, put them together and bake. The entire preparation process takes less than 20 minutes which gives you time to do the other hundred items on your to do list during the busy holiday season. So basically it’s time to change things up this Thanksgiving and say good bye to store-bought pies and hello to irresistible homemade! 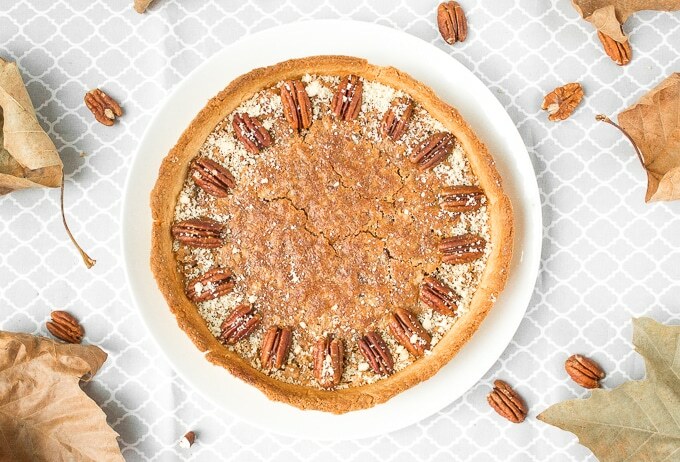 Give traditional pecan pie a twist this holiday season by using finely chopped pecans to create a smooth topping on this chopped pecan pie! Prepare the pastry by combining all the ingredients manually or in a powerful food processor. When combining manually, I sift flour on the kitchen table or large cutting board, make a “hole” in it and add the egg yolks, butter and sugar. Then, carefully mix all together until you form a firm ball. Roll out the dough on the sheet of parchment paper. Place into a pie dish and let it cool in the refrigerator for one hour. Make the filling: Beat eggs in a large mixing bowl. Slowly add sugar and continue beating until the mixture turns into a light yellow colour. Add the maple syrup, butter, salt, and vanilla and mix until fully combined. Stir in the chopped pecans. Punch the pie crust with a fork several times to help release air during baking process. Place pie crust into the oven and bake for 10 minutes, remove from oven, and reduce the oven temperature to 350 F.
Pour the pie filling into the slightly baked pie crust. Bake pie for another 25-30 minutes until the top of the pie turns golden and the filling doesn’t appear to be liquid when you shake the pie dish. Decorate with pecan halves and place it in the oven for another 5 minutes. 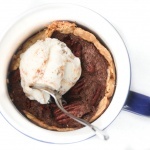 Let pie cool completely and serve. (Optional: sprinkle some pastry crumbs from the pie dish on top). SWOON. Cannot get over how good this looks… like, could maybe eat the entire pie kinda good. Cannot wait to try! 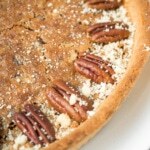 I’m a pecan pie addict and yours look beyond delicious! Need to try this recipe. This looks awesome! 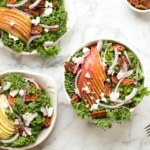 I love the different consistencies! Why isn’t this on my plate right now? I agree — the food is a very big deal during Thanksgiving. 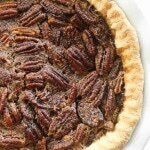 Even though I don’t eat pie, this pecan version looks pretty good. 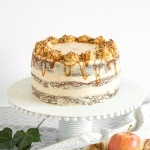 I would love to eat a salted caramel cake for dessert this Thanksgiving. 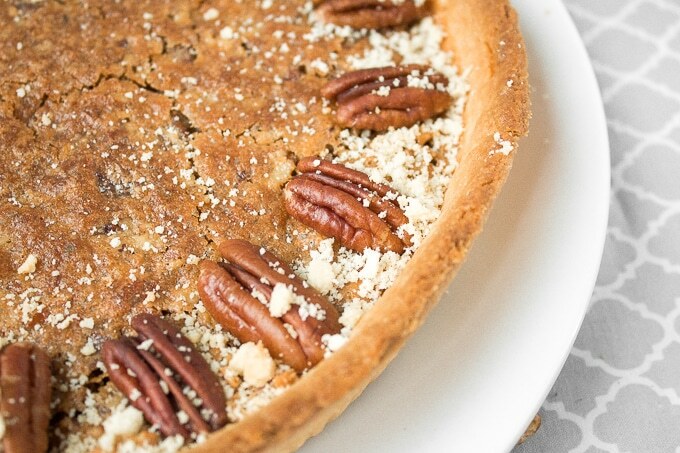 What a fresh take on pecan pie! I stopped making it because the pecans were too big for my kids. Why didn’t I think to chop them up!? !